Hello everyone and thank you for staying with me even though I haven’t been very active lately. My wife and I have recently relocated and are in the midst of launching our Counter Cultural Ministry >>> Triple Seven. Things have been busy and as you know, the war rages on. My wife sent this podcast my way last week and it blew my mind. THE SON OF PERDITION is prophesied to be Satan incarnate on earth in the days leading up to the end of the age. The spirit of antichrist, through the fallen cherub Satan, has been groomed in various archetypes throughout the centuries. But no one best resembles the future global leader of the New World Order, than the original, the prototype, the leader of the first human rebellion against God in the post-flood world, Nimrod. In this interview, Basil and Gonz are joined by the author of The Shinar Directive: Preparing the Way for the Son of Perdition’s Return Dr. Michael Lake. They discuss the events in Dr. Lake’s life that lead him to study the occult and dark corners of our history and our world today. His experiences opened him up to the study of biblical prophecy, including the influence of Nimrod and the tower of Babel in almost all of the occult history of our world, especially in the modern era. The very climate that established the Shinar directive back when Nimrod walked the earth, is being fulfilled right before our eyes, and it will be the remnant who will maintain the truth that is the Gospel message of Jesus Christ. Have a listen and enjoy! 1. There is an undeniable zeal in some teachers of error–their “earnestness” makes many people think they must be right. 2. There is a great appearance of learning and theological knowledge–many think that such clever and intellectual men must surely be safe to listen to. 3. There is a general tendency to completely free and independent thinking today–many like to prove their independence of judgment by believing the newest ideas, which are nothing but novelties. 4. There is a wide-spread desire to appear kind, loving, and open-minded–many seem half-ashamed to say that anybody can be wrong or is a false teacher. 5. There is always a portion of half-truth taught by modern false teachers–they are always using scriptural words and phrases, but with unscriptural meaning. 6. There is a public craving for a more sensational and entertaining worship–people are impatient with the more inward and invisible work of God within the hearts of men. 8. There is a wide-spread ignorance among professing Christians–every heretic who speaks well is surely believed, and anyone who doubts him is called narrow-minded and unloving. Is Kat Kerr a False Prophet? This is my first official post. I did not intend this to be the topic of the first post but it just happened to be the most relevant because this lady is coming to Toronto this weekend. **** This post I have edited from the original since it has gotten much attention I have added to it to reflect the input from the readers. Please do not add comments that have already been addressed. Kat Ker, can we believe her? A few years ago there was a women that came by my church claiming that she has been to heaven, and that God takes her to heaven all the time. I am open to anything and will not write someone off just because their claims are way out there. I know that God has taken people to heaven in the past. As with everything I will give people the benefit of the doubt until they violate some sort of truth that I know from God’s written word or the truth from FACTS that I have already uncovered about a certain subject. We as the body of Christ should not just take someone’s word for it, but test all things (1 John 4:1). On top of that the bible commands us to be discerning and JUDGE the people in the Church. (1 Corinthians 5:11-13) Yes I did say Judge, there are allot of people today that say when you try to point out any error in leadership “you are judging and we as Christians are not supposed to judge but act in Love”. That is a twisting of scripture that they try to hide behind because they don’t want have to have any accountability. People write me and tell me that I have no right to say anything against Kat that I shouldn’t touch God’s anointed, that I am siding with satan the accuser. I tell you straight up that is brainwashed tactics from the emergent church, you are only saying that because you heard that from some preacher or read it in some book. Not only does that not make sense it’s twisting the scripture. This lingo is put out there so you will not question what the leaders are doing, they use it as a scape goat. Kat says that she has visited heaven, not just once but she goes back and forth and a regular basis. She tells her stories of the tours of heaven she has been taken on and then she comes back with messages from God to the Church. She has written a book called revealing heaven and also has this website below. Are her claims true? Does her story add up? Let’s take a look at some of the things she is saying. Let’s examine some of her claims. 1. Frequent visits to heaven: Kat claims to go to heaven all the time, almost like she has a season’s pass to the throne room. We know that God has taken people to heaven before but out of all the stories in the bible and all the modern day stories there has never been a person that has gone as frequently as Kat. 2. Her picture of heaven: Kat paints heaven like a mystical Disney land with roller coasters, movie theaters and even a place to see what you look like with other skin colors. I’m sure heaven is filled with many amazing things, but the far out claims that Kat makes about heaven are not found in the bible and no one else that has been to heaven testifies to the things she is saying. 19 The LORD replied, “I will make all my goodness pass before you, and I will call out my name, `the LORD,’ to you. I will show kindness to anyone I choose, and I will show mercy to anyone I choose. Hmmm the bible says here that no one can see God’s face and keep living??? If you read your bible the people who have been in the throne room and seen God do not describe any of his features. In fact they describe a much different scene that Kat. Kat makes the throne room seem like a playground. She says there are multiple throne rooms. Everyone from the bible and even modern day people have described encounters with God in the throne room as fearful, awestruck and trembling. 24 And Jesus went out from the temple, and was going on his way; and his disciples came to him to show him the buildings of the temple. 2 But he answered and said unto them, See ye not all these things? verily I say unto you, There shall not be left here one stone upon another, that shall not be thrown down. 3 And as he sat on the mount of Olives, the disciples came unto him privately, saying, Tell us, when shall these things be? and what shall be the sign of thy coming, and of the end of the world? 4 And Jesus answered and said unto them, Take heed that no man lead you astray. 5 For many shall come in my name, saying, I am the Christ; and shall lead many astray. 6 And ye shall hear of wars and rumors of wars; see that ye be not troubled: for these things must needs come to pass; but the end is not yet. 7 For nation shall rise against nation, and kingdom against kingdom; and there shall be famines and earthquakes in divers places. 8 But all these things are the beginning of travail. 9 Then shall they deliver you up unto tribulation, and shall kill you: and ye shall be hated of all the nations for my name’s sake. 10 And then shall many stumble, and shall deliver up one another, and shall hate one another. 11 And many false prophets shall arise, and shall lead many astray. 12 And because iniquity shall be multiplied, the love of the many shall wax cold. 13 But he that endureth to the end, the same shall be saved. 14 And this gospel of the kingdom shall be preached in the whole world for a testimony unto all the nations; and then shall the end come. Kat’s prophecy is also a direct contradiction to the Facts that I know to be true about the world today. For her prophecy to come true Christians would have to take over the entire anti-christ system put in place. The day and the hour is late and the devil is setting up his kingdom through a one world government. He is doing this through the New World Order and the secret societies. If you are not up to speed on these things you need to do some research to see how the world really operates. If you are about to throw this argument out on the basis of a worldwide conspiracy you better listen to this next piece. I phoned Kat Kerr personally to talk about these contradictions, she stated herself that she KNOWS about the New World Order and the Illuminati! So if you are about to stop listening to me because I believe in conspiracy well than you need to stop listening to Kat too because she told me she believes in it too. She proceeded to tell me that God was going to do something really amazing in the white house in the summer of 2010 to change the situation. Even though she admitted to knowing about the conspiracy herself and continues to make predictions of this false golden age coming. Well guess what 2010 came and went and her prophesies were false. I contacted her about this false prophecy and she refused to answer why her prediction was false and then put it back on me saying I need to believe God and in his timing not my own those things she predicted would come true. She I guess forgot that she gave a specific date. So if she is constantly going to heaven and communing with God why would she give a false prophecy? Why does her view contradict the bible and other prophetic messages today? The true message to the church is not get ready for the glory, but rather repent get your hearts right and get ready for persecution and judgment. The church in North America is in a horrible sin state, do you think God is going to send his glory? Check out these prophecies by David Wilkerson, his prophecies have been tried and tested for decades. His message is the opposite of Kats. 5. Mitt Romney is God’s Choice for 2012: Kat claims God told her that he wants everyone to vote for Romney. Yes she actually says he is God’s choice and that Romney stands for Justice, Truth and Life. Just watching this video to me makes this women very un credible, declaring that she is heaven’s revelator with some dude standing in the background with his arms crossed. This is a big problem when someone that claims to go to heaven all the time is getting involved with worldly politics to the degree that she is telling people who to vote for. This is public manipulation to persuade public opinion. She says she knows about the New World Order and does not tell people the truth that no matter who they vote for things will not change! The government as in most nations is a puppet government controlled by a shadowy elite. You may not believe that, but that is the truth. Even if you don’t believe that, can you believe that Mitt Romney is a Mormon? Mormonism is a cult and at that it is a Satanic cult. How can she really think God wants you to vote for someone who belongs to a satanic cult. Really there is no choice, a Muslim (really I think he is a Universalist) or a Satanist. Mormons want to create a worldwide theocracy where Jesus Christ will come back to rule. This leads me to my next point. 7. Doctrine of Pre- Existence: Kat states that she sees little orbs that are spirits before they are born circling around the throne asking to be sent down to the earth. Not only is this not biblical it is also a New Age teaching. Some people have stated that there is nothing wrong with this. This idea in itself is neither wrong or write because we just don’t know. BUT it is NOT in the Bible and this idea is closer to new age thinking. 8. Focus on Heaven & Glory: Kat says that the forward to her book was written by scribe angels. That with her introduction talks all about heaven invading earth and the glory coming. She states that God is eager to give earth his greatest gift Heaven. There is no mention of Jesus here all the focus is on heaven. This is not right, everything is about Jesus and every message from God in the past was to reveal Jesus NOT heaven. She is taking focus off of his written word and his living word Jesus. Read the intro, does it really sound like scribe angels??? Wake up people!! Those are a few of the core problems with Kat’s Claims, there are also some other things that I will just mention. Remember this lady claims to go to heaven on a regular basis, so we should see some pretty amazing stuff from her. I have also heard her in video interviews contradict her stories of how she first got taken to heaven. I don’t have time to cross reference all she says, so if you find something post it in the comments. 2. 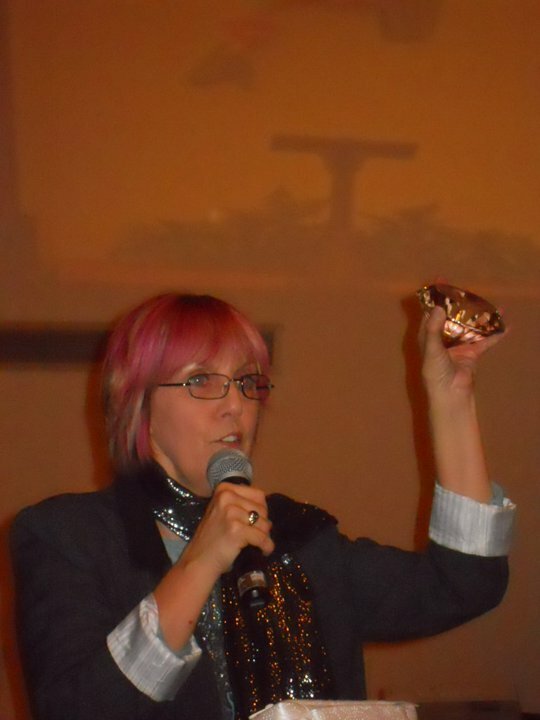 She holds up giant fake gemstones in her meetings and talks about how God is dropping real ones?? If she really goes to heaven so much wouldn’t she stop in the gift store and get a real one as evidence?? 3. For her mandate of getting this message out to everyone her books and dvd’s are grossly overpriced. For poorly made dvd’s and books she is charging over $20 a piece! Someone told me her prices have dropped by when she came to my church a few years ago that’s what she was charging. 4. She says she has seen someone who I know is a 33rd degree free mason taken to heaven in a Chariot. Satan worshipers go to heaven too? And recently she claims Whitney Housten is in Heaven? Is that true? Who knows if Whitney repented on her death bead. Kat Ker says Micheal Jackson is in heaven?? Well this testimony unlike Kat’s shook me to the core of my spirit: 23hrs dead Angelica Zambrano, she went to Heaven and Hell and claims she saw Micheal Jackson in Hell. So who is lying? This girl or Kat? 5. She states on the Patricia King show that the 12 elders before the throne are ancient beings not human, not angel but something else? …Aliens perhaps? I could continue with many more pages but I think I have highlighted the most important. Has Kat really been to heaven? Does she really speak the words of God? 9. Charges way too much money for her stuff. We need to beware of false prophets. Kat may say lots of nice things that make us feel good, she may even say Jesus is Lord, but the truth is that she is deceived about many things. We must stay grounded in the word of God and keep our minds focused on God’s essential truths. I do not know for what reason she is lying, she needs to repent of what she is doing so that she will not be judged by God on the day of the Lord. It is possible she believes what she is doing, her experience of first going to heaven was in a church where she was on the ground shaking for many hours in a trance. Sometimes God can do that, but also this is very characteristic of the counterfeit spirit in the third wave church. Some people comment that I need to let God out of the box, that my mind can’t accept Kat’s experience because I’m too religious. If you only knew the truth about me. None of you know me or have met me, so who are you to judge me? you are going on nothing. I believe other’s have gone to heaven, I believe in miracles, speaking in tongues, prophecy and have been a part of the Third Wave for 4+ years. My ministry is throwing parties in nightclubs in order to win the lost. How is that for getting God out of the box! So before you post a comment on my blog telling me off you better go do your homework. People read my blog and read Kat’s book or watch one video and think they know it all. I urge my readers to get the big picture, read my series on the Church, and read this whole post instead of knit picking at little parts. Normally I would never bother with someone like Kat she is a small player on the scene, but since she invaded my personal space by deceiving my church I will make the truth known about her. I believe that people who belong to the Truth, to Jesus Christ should not be walking in deception. I have started this blog in hopes of lifting the veil of Deception that has been put over the world by the enemy of our souls- Satan. Since I was a child I have discovered that the world was not really the way people had told me it was. I have found also that what I have been told about how to live out my faith,many times was incorrect. After realizing that people I trusted to teach me the faith were continually wrong about major points I had to question what was really going on in the world. I have come to know that the secular world was run by deception, but I found it hard to believe that the church also was run by deception. Continually Jesus and the apostles were warning us to watch out for false prophets and not to be deceived. It says in the bible that in the last days deception will fill the earth. Today there is a cloud of deception over the world and even the church. It is shocking to find that very few Christians have any idea what is really going on and even fewer that know and are actually saying something. Any church that does not recognize the fact that mass deception is going forth cannot be on any kind of cutting edge of the kingdom, in fact more than likely they are on the cutting edge of Satan’s kingdom. It seems that the people least affected by this deception are the people that keep to the fundamentals of the faith and keep doing the true work of God. Today everyone is searching looking for the next move of God, waiting for the glory cloud to fall and big sensational revival. I’m telling you that it is right here if you want it, it’s found in your Bible, On your knees, out on the street bringing Jesus to the masses. This blog will be revealing what is really going on in the world and the church. I cannot keep silent any longer, I need to speak the truth. I know that a lot of people will not like some of the things I will be talking about and even start to hate me, but it’s time to wake up and stand for the TRUTH. Deception free! !